I was really excited to get to watch Tomorrowland. This is a movie that both my daughter and I wanted to see and so glad we got to watch it together. It definitely did not disappoint. Tomorrowland is a movie to inspire everyone that anything is possible and that if you set your mind to it, you can achieve it. Not only is it inspiring, but it's also filled with tons of adventure that will keep you on your feet from beginning to end. I absolutely loved this movie. It was great to see both my kids really into the movie and I loved how much it inspired them and got their creativity juices flowing. Both George Clooney and Brit Robertson hit their characters spot on and worked so well with one another. Definitely a movie to watch with the entire family. 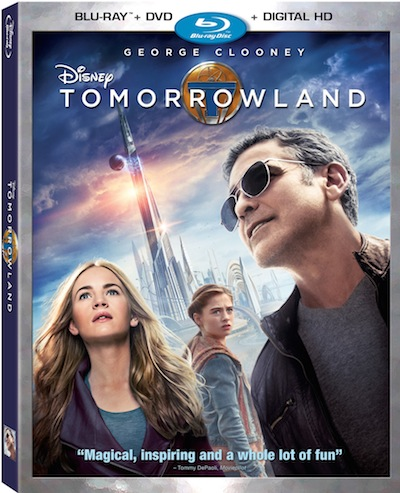 Tomorrowland is now out on both Blu-ray and DVD. Disclosure: All opinions are my own. I received Tomorrowland on Blu-ray at no cost for the purpose of this review. No other compensation was received.